This is the ad supported version of "Texting Adventures” the Z-Machine story interpreter for your phone. Sick of standard phone games? Want stories that focus on depth instead of mindless button mashing? Or maybe you just want to get your Zork on? If so, welcome to the world of Interactive Fiction! 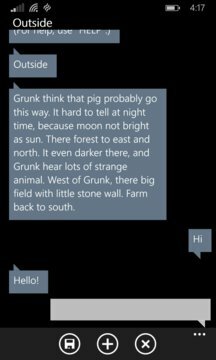 Interactive Fiction, also called text adventures, are stories waiting to unfold as you guide your alter ego by texting where to go and what to do. Text adventures have been around for 30+ years, which means you have access to endless stories available for download (in most cases for free) ranging from crime to horror, fantasy to science fiction, and drama to comedy. 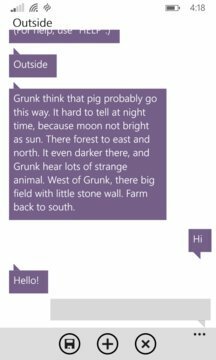 “Texting Adventures” is a Z-Machine story interpreter (based on Frotz) with a sleek SMS-like user interface -- it even uses your phone’s SMS color theme. While it doesn't come with any games, as a Z-Machine interpreter it supports common z-code files types (z1-z8). You can download thousands of z-code games free online or you can open them directly from OneDrive, DropBox, email, or any other way you get files onto your phone. Once this app is installed, anytime you open a z-code file on your phone, Texting Adventures will automatically start the game, as well as add the file to the in-app game list for quick access later.